Manthan Award 2010 is a Two-day event on December 17 & 18, 2010 being held at Hotel Parkland Exotica, Chhattarpur Mandir Road, New Delhi. 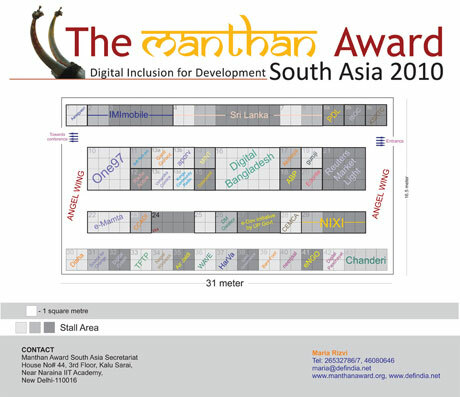 Manthan Award 2010 Finalists would be showcasing their innovations and projects in the exposition area of this highly enriching and comprehensive conclave of knowledge, ideas & innovations. Space and options for showcasing are very limited, and therefore please block them soonest possible. A stall at the exposition enables one-to-one interaction with domestic and international delegates that include innovators, practitioners, large corporations, investors, NGOs, semi-government bodies, senior government officials and academics. Also see the Provisional Agenda & floor plan. Other options are mentioned in the floor plan. There are limited number of stalls and allocations are strictly on First Come First Served Basis.